A very hotly-debated topic now is the right to conceal carry a handgun on college campuses and school property. What seems an obvious or pretty basic decision by many, is not by others. It can become complicated. Some even add the issue of faculty and students carrying a gun at ANY school-related event or activity ANYPLACE. So, this latter consideration could involve college football games (home and/or away games) or off-campus school-sanctioned fraternities, sororities, sponsored clubs or organizations and their events. Beer Busts? Hazing activities? This issue can involve a lot of folks, places, many Benjamins, and maybe even borderline immoral or illegal activities, let alone the right to conceal carry in general. Many maintain that the Second Amendment rights do not stop at college campuses and that all people have a God-given right to carry their guns on campuses and to not be a victim. Especially, that women have a right to protect themselves from sexual assaults. Open Carry (can openly carry a firearm in public; not concealed carry) is allowed on certain public college campuses, e.g. Utah. Forty-five states currently allow Open Carry. 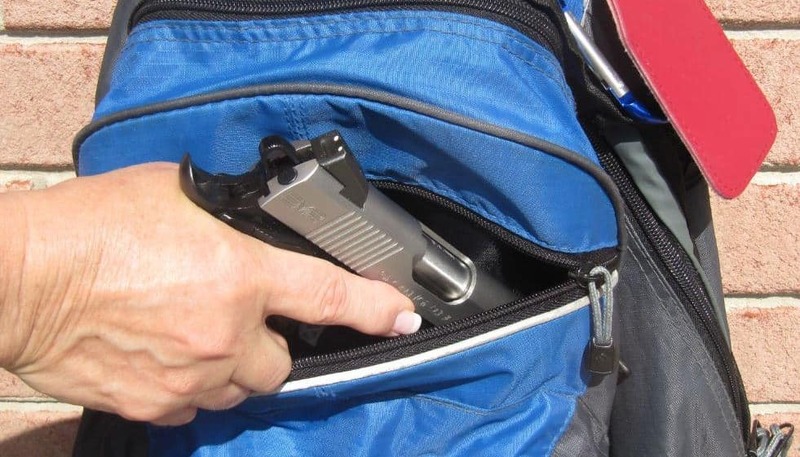 Five states prohibit Open Carry in public: California, New York, Illinois, South Carolina, and Florida. So many issues and factors to consider. Some strongly believe that students, faculty, and staff should NOT be allowed to carry handguns on school property… and for any college-related event or activity, while others believe just the opposite. Campus concealed carry generally only pertains to public colleges and universities, although some states require private colleges to take an affirmative step to opt-out. Now, all 50 states allow citizens to carry concealed weapons, if they meet certain state requirements. Eleven states allow campus carry at this time, with 16 more states considering it. Those allowing it say that an armed faculty or staff member (some add armed student) could have prevented or diminished the recent casualties at campus shootings. Others disagree. There is a wide variety of changing handgun and/or concealed carry laws and complexities among several states. * Michigan law currently prohibits concealed carry permit holders from carrying concealed handguns in “gun-free zones,” including college classrooms and dormitories. However, the Michigan State University (MSU) Board of Trustees voted to change its policy concerning concealed carry on campus in 2009. Previously, guns were completely banned from the MSU campus, but they voted to allow guns to be carried through campus, as long as the guns remained out of campus buildings. The Board made the decision so that campus policies were better aligned with state law. Now MSU allows visitors (but not employees or students) to concealed carry on university property, except in classrooms and dormitories, per ArmedCampuses.org. In Michigan, a person with a concealed carry license may legally open carry as long as they are 18 years of age and lawfully purchased the pistol, per MCL 28.422. In 23 states the decision to ban or allow concealed carry on campuses is made by each college or university INDIVIDUALLY, like in Alabama, Arizona, Indiana, Maine, Maryland, Oklahoma, Washington, and West Virginia. In 2017, two states passed legislation to allow faculty and students to carry guns on college campuses, Arkansas and Georgia. Since 2016, a Tennessee law allows full-time faculty and staff members, not students, with handgun carry permits to carry firearms on campuses in their college system. In 2017, there is a bill to extend that right to valid Tennessee permit holders, including students, but there is opposition. Utah was the first state to allow guns on campuses in 2004. In 2015, Texas became the eighth state to allow concealed carry weapons on college campuses. In December 2016, Ohio law lifted the ban on firearms on college campuses and allows the concealed carry decision to individual college institutions. In 2013, 19 states and in 2014, 14 states introduced legislation to allow some form of concealed carry on campuses. Legislation passed in Mississippi in 2011 that creates an exception to allow concealed carry on college campuses for those who have taken a voluntary course on safe handling and use of firearms by a certified instructor. There is a lot of varied state legislation pending now, so carefully get updated regularly on this issue. 16 state Bills have been introduced so far now in 2017, e.g. Alaska, New Mexico, North Carolina, and South Carolina. For faculty, staff, and students, I generally understand that violating campus concealed carry law by intentionally displaying a handgun or going into a restricted gun-free campus carry area is usually a Class A misdemeanor punishable by up to one year in jail and a $4,000-$5,000 fine, depending on the state. Most states require the faculty or student to already have a concealed carry permit or license (usually age 21 to acquire), so those under the age of 21 would not be permitted to concealed carry. Probably the majority (not all) of students are under age 21. As a legal layman, I understand that those without a valid permit or license to concealed carry who enter a campus building with a handgun probably commit a third-degree Felony, usually punishable by jail time of 2 to 10 years and a fine up to $10,000. Remember, I am not an attorney and not giving legal advice nor opinions. There are many complicated and involved issues about concealed carry on college campuses. Just one complicating factor on college campuses is “may faculty members inquire about whether or not a student has a concealed carry permit/license.” Another is “may faculty members take any action against a student.” If so, what? Of course, this varies greatly by state laws and college policies. Usually faculty members may ask, but from what I understand as a layman, students are not required to provide that information. Nor may Faculty members usually not take any action against a student who chooses not to answer or coerce them. Much uncertainty and subjective interpretation here. Still another important college concealed carry issue is what happens if there is an off-campus event or activity which is college related and/or sponsored, and someone displays a gun? While Arkansas law, for example, allows concealed carry on college campuses, it prohibits carrying at collegiate athletic events, like football games. Of course, your state laws and location and/or the individual college policy (if in existence or appropriate) would determine whether concealed carry or open carry is legal or permissible and where. Student conduct standards and college police rules and policies are also involved. Again, much to consider and several states and colleges do not have specific guidelines, rules, or policies in effect yet about this. What if a student living in one state decides to go out-of-state to a college with a completely different set of rules and state concealed carry laws? College campuses have become a new battleground in the issue of concealed carry on campuses and involvement of Faculty and staff members. Tennessee law allows all full-time college employees, including Faculty members, to concealed carry. Their state law does protect higher education institutions from monetary liability for the use of handguns. Again, many issues and liabilities involved, aside from Second Amendment rights. Some colleges have relaxed their rules, such as Liberty University in Virginia and Texas A&M University, where a ban on firearms in residence halls and dormitories will probably be lifted now. In Ohio, individual colleges can decide about concealed carry. Just this month at Cedarville University in Ohio, the decision was made to allow full-time employees (faculty and staff) with a concealed carry permit to carry on campus, after submitting an application and getting approval. Concealed carry is not open to students or part-time employees. Arkansas became the 11th state to allow concealed carry on campuses about a month or so ago. Arkansas faculty and staff have been permitted to concealed carry at public colleges under a 2013 law that required schools to opt in, but none had previously. In Arkansas, the concealed carry permit requires training that teaches how to handle their guns in various situations. The training is more about the legalities and the use of deadly force as a concealed carry permit holder, in addition to how to operate a gun. In Florida now, it is not legal to carry a firearm on college campuses by a student, faculty member, or staff. Florida is one of the 16 states with this ban. According to the Florida Carry Association, it is legal for a faculty member, employee, or registered student of a college or university who has a concealed carry license to carry a concealed stun gun or non-lethal electric weapon/device designed solely for defensive purposes, as long as it does not fire a dart or projectile. They also say that you may legally possess a firearm in your personal vehicle (securely encased) at any Florida college, university, or tech school. Also, Florida Carry says that it is legal to store a firearm in your personal vehicle at any private school in Florida. Keep current on state concealed carry laws because they are changing frequently now. I hope this update on concealed carry on college campuses have given you some recent information that you do not have and caused you to think about this hot issue, the varying and complex requirements and laws, and our Second Amendment rights. Next articleAnother Good-Guy with a Gun in Illinois!